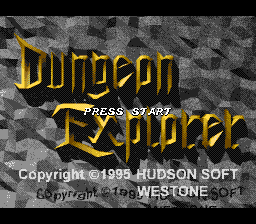 Dungeon Explorer is an action RPG developed by Westone and Hudson Soft and released for the Sega Mega-CD in 1995. Despite sharing a name, the Mega-CD Dungeon Explorer is not a port of an earlier Dungeon Explorer, released for the PC Engine in 1989. While related, the Mega-CD game is designed to play more like Atari Games's Gauntlet, and is exclusive to Sega's system. Voice Actors: Shinichi Sakamoto, Hidewa Nakazima, Jin W.
NEC Retro has more information related to Dungeon Explorer.